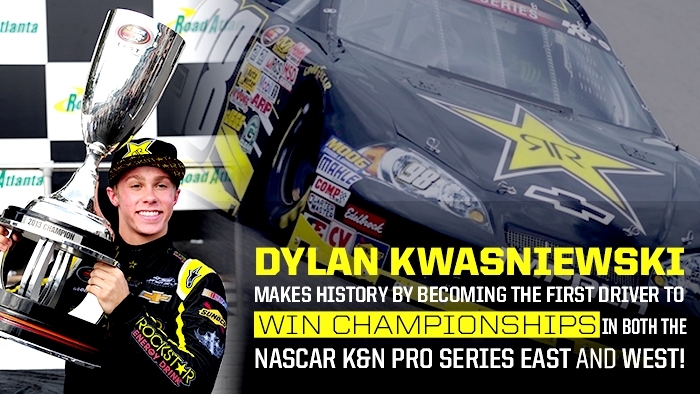 Kwasniewski Crowned 2013 NASCAR K&N Pro Series East Champion BRASELTON, Ga. (October 18, 2013) - Dylan Kwasniewski has claimed his first NASCAR K&N Pro Series East (NKNPSE) championship. After graduating from high school and relocating to North Carolina from Las Vegas, Kwasniewski was quick to make himself known out east, becoming the first NASCAR K&N Pro Series driver to win championships in both the NASCAR K&N Pro Series East and NASCAR K&N Pro Series West (NKNPSW), achieving the feat in back-to-back years. After a tight battle coming into the final weekend of the season, Kwasniewski went on to win his sixth race of the year in the No. 98 Rockstar Energy/Royal Purple Chevrolet, edging out his closest competitor to be crowned the 2013 NKNPSE Champion. Kwasniewski began racing in the NKNPSW in 2011 for Gene Price Motorsports. Despite having to miss a race, he was still able to end the season with Rookie of the Year honors. He returned to the NKNPSW in 2012 and scored three wins, six poles, 12 top fives, and 15 top 10s en route to his first NASCAR championship at only 17 years old. After relocating to the East Coast earlier this year, Kwasniewski ran the full NKNPSE schedule with Turner Scott Motorsports (TSM), a team new to the series. After running away with the points lead earlier in the season, two disappointing finishes in the past two races forced a close points battle, coming down to the final race at Road Atlanta. After rain washed out qualifying, Kwasniewski started from the pole, with his closest competitor for the title right beside him. In true championship fashion, Kwasniewski got out front of the field and never looked back, leading all 28 laps of the Road Atlanta 115. This year for Kwasniewski was another one for the record books, as the 18-year-old captured six wins, three poles, eight top fives and 10 top 10s. "I entered this season with one goal and that was to win this championship," said Kwasniewski. "To be able to accomplish it is very gratifying and I'm very grateful for everyone that helped make it possible. I really have to thank [crew chief] Marty Lindley and the rest of my Turner Scott Motorsports team. From our very first race out, we were successful. You never would have guessed this was a brand-new team. Through all the ups and downs of our season, I always knew I had the very best team. I also want to thank Rockstar Energy Drink and Royal Purple for having enough faith in me to make the jump from the West to the East. I'm very honored to bring them another championship."